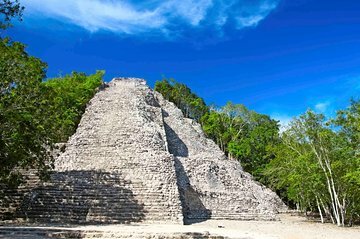 Escape the tourist crowds and explore the atmospheric Coba ruins in peace during an early access Coba ruins full-day tour from Playa del Carmen. 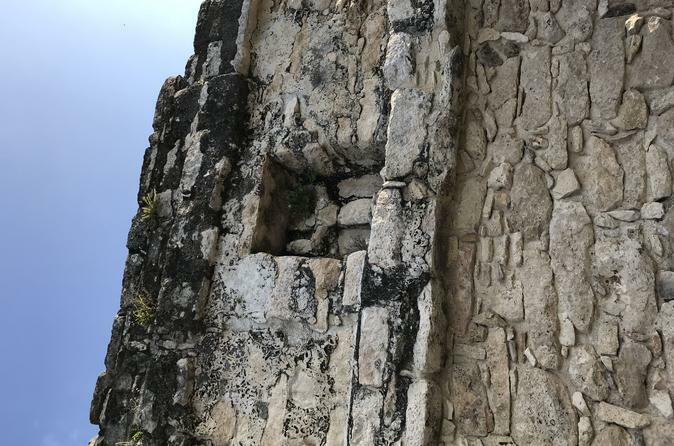 On this Viator Exclusive tour, discover the ancient Mayan city of Coba with an expert archeologist guide and gain in-depth knowledge of the site. Ascend to the summit of the Yucatan’s highest pyramid and enjoy a refreshing swim in a secretive underground cavern. Lunch and return transport from and to your Playa del Carmen hotel are included. This Viator Exclusive is available nowhere else! Stig tidigt och hälsar din förare på ditt hotell i Playa del Carmen. Njut av en vacker 90-minuters bilresa till Coba och vid ankomsten hälsar du din professionella och certifierade arkeologguide. Ange den ikoniska webbplatsen och förundras över en av de största pre-colombianska bosättningarna i klassisk perioden. Njut av den tidiga morgonns lugn när du vandrar Cobas omgivande ruiner, lyssnar som din guide erbjuder en fängslande kommentar. Absorbera information om översättningen av webbplatsens Maya-namn, vilket betyder "plats för hökigt vatten" och höra spännande historier om den antika civilisationen som ockuperade 43 kvadratkilometer (70 kvadratkilometer) på 1200-talet. Besök stora stenmonument dekorerad med hieroglyfiska texter och få insikt om hur staden behöll ett användbart förhållande med regnskogen och omgivande sjöar. Följ sedan upp den upphetsande höjden av Nohoch Mul Pyramid på 140 fot (42 meter) för att njuta av spektakulära sevärdheter i den omgivande regnskogen. Lyssna på exotiska fåglar som du gratulerar dig till att klättra på Yucatans högsta pyramid. Fortsätt att njuta av den idylliska atmosfären av crowd-free Coba när du vandrar till nästa fantastiska syn. Nedstigning till den bländande djupet av en underjordisk cenote för att njuta av en timmes uppfriskande och avkopplande stillestånd i det kristallklara vattnet i den naturligt upplysta grottan. Äta på en tillfredsställande buffé lunch i en närliggande restaurang, njut av lokala specialiteter, god pasta, färska sallader och söta efterrätter. Avsluta ditt arkeologiska äventyr genom att återvända till ditt hotell i Playa del Carmel. We booked this tour with Viator as it seems to be the best value. We stayed very near 5th Av in PDC and so were asked to go to HM hotel at 6:15 am to wait for the pick up. The mini-bus was punctual. The next 45 mins was then spent picking up 6 other travellers staying in various places in Playacar. We then travelled another 20-30 mins to another location where we were then transferred to a big coach with probably another 25-30 people. Only after this did we proceed to Coba - arriving there about 9 am, where there were already a few other coaches. We were there in the low season so it wasn't crowded. I am not sure what it would be like during the busy season. I am giving these details so that those booking would be aware that Early Access doesn't really mean very early. A straight journey from PDC would probably only be 90 mins but the journey time here was doubled because of the pick-ups and transfer to the other big coach. We had booked a English guided tour but were the only English speakers in the entire group. The guide spoke Spanish and English but I think the English translation bits of everything he said was probably only about 20-30 of all the info he gave. We got the gist of it but did get rather bored at various times. I guess maybe it was the low season and they didn't have enough takers to make a full English tour. Coba is certainly worth visiting, even if you've already visited Chichen Itza and Tikal. The area is big and the bikes were therefore very useful hire cost included for getting around. If you didn't fancy cycling in the heat or want to save your legs for the climb up the temple, you could pay an extra 50 pesos in sit in a pedi-bike instead. Climbing up the temple is the highlight and the view from the top is fantastic. Going up is certainly less scary than coming down. There is a rope to help but beware that quite a few of the steps are rather worn and sloping and can be slippery. We've heard that they may stop visitors from climbing up by the end of 2018 so were glad we got the chance to do it. After Coba and before lunch, we were brought to the Tamcach-Ha cenote. This is an underground, mostly covered cenote so the water is cooler than the open ones we've been to. You descend into it via a winding staircase and along the way, you can choose to dive off platforms around 10m or 5m above the water. Those in fact were the best bits according to by kids!! The buffet lunch was pretty OK - we weren't expecting too much and was surprised by the variety. Drinks had to be paid for but were reasonable. The journey back was the reverse of the outward journey, with the transfer back to the minibus and the various drop-offs - but probably shorter by a few minutes as it was minus any waiting time for people to arrive for pick up. I think if we had a car, it would have been better to do the visit ourselves to avoid the extra 3 hours of travelling time but in the absence of one, this tour of Coba is worth doing. Amigo Tours was great to deal with. Accomodating with a late cancellation and rescheduling due to an illness in one of our party. Sarah shared alot of background information on the way to Coba both in Spanish and English and briefed us on our day. After a brief restroom stop before the ruins at a very nice craft shop, we arrived in Coba shortly after opening. Sarah provided alot of great information on ruins as we went as well as natural features plant life and wild life. We very much enjoyed the ruins leading up to the main pyramid/temple. The bikes were a great way to travel and enjoy the surroundings. We had about 45min on our own after Sarah left us at the main pyramid for a climb. As with our other tours to Mayan sites, we would love more time as it was a quick climb to the top and a race to find the other stellae site to rendez-vous with the van at the end. It was a blessing that the cenote was a short 10-15 min drive away. We went to Tamcach-Ha instead of Choo-ha all really in the same location and it was a great choice. We didn't go in as I am not keen on the deep waters and cooler temps chicken but many people were having a great dip and jumping from the 2 platforms. Life jackets are available for rent. Beautiful, fun cave cenote - be brave and enjoy! Lunch was again close by near the Coba ruins on one of the few lakes around. Very tasty and fresh buffet. Pricing in the shop below seemed dubious and think that I wasn't a very savvy shopper and paid way more than I should have - just be careful. Driver sorry cannot remember name was excellent! Back at our resort in Akumal by 2pmish - was really nice to have a tour that was not so intense as others we had been on. I'm afraid that there were pros and cons with this tour. We went to Coba a couple of years ago on a tour. At that one, they provided bottled water whenever we needed it, and we were told to bring sandals to walk down into the Cenote. We were also provided with towels. The notes for this tour said that we were supposed to arrive before the gates opened, but by the time we arrived there were already tons of people there. Our guide was awesome, and taught us so much about the history of the Mayans and explained the ruins that he took us to. We were not told to bring sandals, bottled water and towels, and none of these were provided for us. You should stress to people that they really need to bring these things, and to specify that none of them will be provided. Take a bike ride to the main temple, as it's too far to walk. Definitely hike up to the top of the temple, as the view is incredible. It's humid, so make sure you have a lot of water to hydrate yourself. The buffet lunch was o.k. We did this tour with Alvaro on March 7th. We stayed on the north end of 5th Ave and were told to be at the HM Hotel at 6:30 am. Of course there were no taxis at 6 am when we left our condo, so we walked there, which was actually the nicest walk up 5th we had. No one trying to sell us drugs or hassle us to buy crap, or pretend they had been our waiter the night before. I digress, we got there early and waited and waited. Apparently they tell you to be there at the time they think you need to leave your lodging to get there on time. The van arrived about 7:20 so just be aware it's an estimated time. I'd rather by early than late, but our boys were a bit cranky at wasting an hour sitting on the edge of a concrete planter in the dark instead of sleeping. The van was nice. Alvaro was a very good guide and I was amazed at how easily he switched between Spanish and English. Coba was pretty neat. It's very different from Chichen Itza. The buildings aren't carved so it wasn't as beautiful but no human sacrifices were done there, which I considered a big plus! We loved climbing the pyramid. It wasn't bad coming down, we just side stepped without any problems. The bike ride was nice too. We actually saw a monkey swinging through the trees with a baby hanging on, so that was neat. We got good and hot so the cenote was heavenly. That was my favorite part of the tour. The lunch was buffet style and very good. The other people on our tour were very nice. We were back to the HM and walked to our condo by 3:30 pm. It was a good value and we enjoyed our tour. This was a great trip. We took two kids and did not want an all-day trip. Bring snacks, as it is a long morning before lunch. Coba was impressive and accessible the climb is a bit scary and probably not for everyone, but the view from the bottom is good too!. Riding the bikes in the jungle was a treat for the kids. The cenote was beautiful and impressive and so was the buffet lunch in a lakeside restaurant. Very nice trip! You get a lot for a great price!! David was our guide, he was nice and very knowledgeable. I loved that we were able to ride bikes to each location, and the cenote was absolutely beautiful! Made for a pretty early morning, but it's worth it to get there before the heat and the crowds. Very nice day, our guide Alvaro is a wealth of information on the history of the area and the culture of the Mayan's...And the bus driver was great. The lunch provided was at a restaurant nearby and featured many delicious authentic Mexican dishes. We appreciated being picked up in front of our hotel and dropped off as such. Be sure to dress for warm weather and wear some comfortable walking/hiking shoes, as you will want to climb the ruins for the spectacular view from above. Also, swimwear for the underground Cenote For the price, this would be a tour to book! We were picked up on time. This was one of the best trips we have ever done. Normally we are people who like to be independent and go to places alone but the draw of the archaeologist made us book this trip. Our guide from Amigo Tours was Alvarro. He's a great guy and very knowledgable. We would not have learnt what we did without him. It was an amazing sight. You can still walk up the pyramid but we didn't. The descent looked too scary for me! The whole sight is fantastic and we are so pleased we booked this trip. Great also to swim in a cenoteh. If you are planning a trip consider this one. Tour guide was great, lots of background information about the Mayan culture and the Coba Ruins, and very kind and patient. Spoke English and Spanish fluently. It was nice to be picked up at our resort right on time too! and fantastic to get to Coba early before the big crowds. The view from the top of the pyramid was worth the climb. Bikes made it easy to get around the site quickly and were fun to ride, but they definitely need some maintenance work. The downside which was not the tour's fault is we had very young children and people that didn't know how to ride bikes! So a scramble was made to find/hire workers to cart them around. People, if you cannot physically do the activity or your children are too young to appreciate what they are seeing then don't book this tour. And if you must bring young children realize they will get hungry, thirsty and tired. So be prepared with snacks, water and the ability to either carry them or stay back and not insist the entire group wait while you deal with the meltdown. I have children, I get it that things happen, but thought and preparation go a long way in making everyone's experience better. So if people cannot figure out on their own that young kids are not going to enjoy this perhaps the tour company can make a minimum age requirement?